Old World Market on Davis Blvd, just west of Shadowlawn Drive, has something good for everyone, offering over 900 items from Greece, Macedonia, Turkey, Bulgaria, Egypt, Albania, Croatia and Serbia, to name a few! 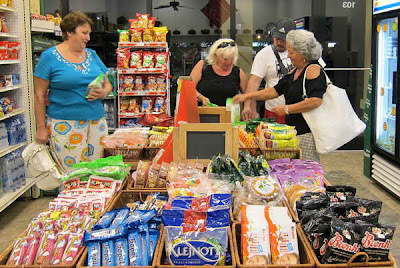 During my visit, a Bulgarian quartet visiting from New Jersey beamed as they bought Bulgarian yogurt, French, Greek, and Bulgarian Feta cheeses, mineral waters by the liter, and cold cuts. 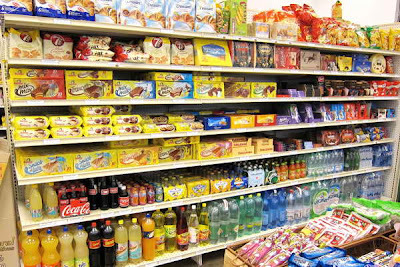 One said, “This store has top quality foods (from back home) that we can’t even find in New York!” After filling up two shopping carts, off they went with their prizes, nibbling on some as they left! There truly are prizes here. Sample over fifteen (15) different feta cheeses alone, and a broad selection of perhaps 30 other cheeses, priced way less than at grocery stores. 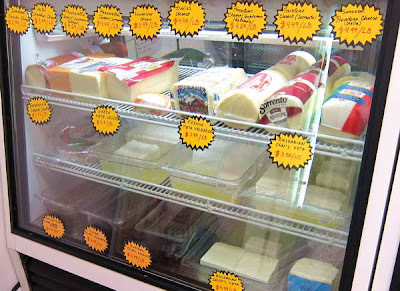 Muenster, Mozzarella, Swiss, Provolone, you know the ones! Let’s talk yogurt. Yoplait and other “yogurt foods” sadly are artificially sweetened with funky chemicals. A Yoplait Yogurt product’s label discloses the presence of gloppy “high fructose corn syrup”, and “modified” corn starch as the 2nd and 3rd most prevalent ingredients. Yoplait then tosses in MSG’s controversial chemical cousin- Aspartame, and Potassium Sorbate, Citric Acid, Yellow #5, and Blue #1 to preserve and color the corn syrup, and make it cling like mucus to your lips. “Frankenyogurts” contibute to tooth cavities. Do corn syrup and MSG-type chemicals really belong in your food? There’s an easy, healthy solution. 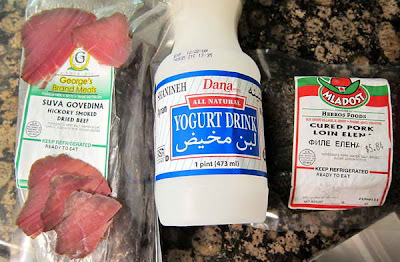 Go to Old World Market to enjoy the far tastier natural, healthy yogurts. Old World Market has several, especially the Bulgarian varieties. 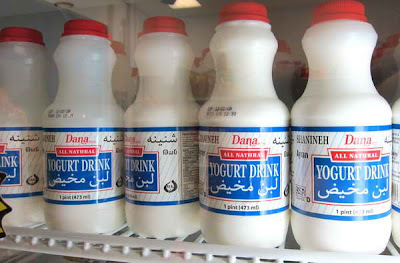 The Dana Yogurt Drink has that welcome, natural touch of tartness with real Bulgarian Lactobacillus bulgaricus. Live longer, avoid Frankenyogurt’s corn syrup, calories and cavities. It’s that easy. Owner “Moe” Momtchil Dimitrov originally hails from Bulgaria, and he knows well the nuances of Mediterranean region’s cuisines. 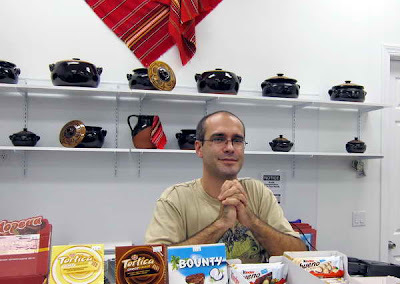 His high quality selections are reflected in his customers smiles, as they buy and start drinking and nibbling, while still in the store! 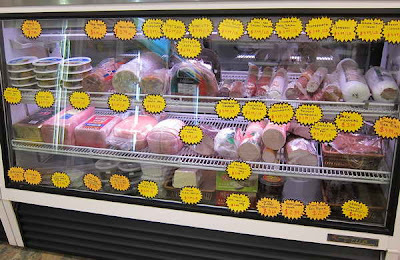 There are over 40 different cold cuts, at prices less than grocery stores, and more authentic in taste. I bought some Hickory Smoked Dried Beef (Suva Govedina) that is as tasty as any charcuterie from France or Italy. The Cured Pork Loin Elena is as beautifully lean and tasty as any Pastrami imaginable. The Beef (Sudzuk), and Pork Sausages sell fast. 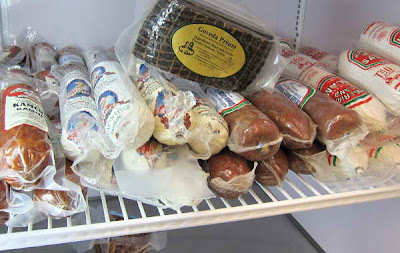 Take home slices of the best of Mortadella, Bologna, Dry Salami (Moskovskaya), Smoked Bologna, and Sorpressata. Slice these thin, have a sip of wine, and enjoy life’s simple pleasures. Like pierogies? 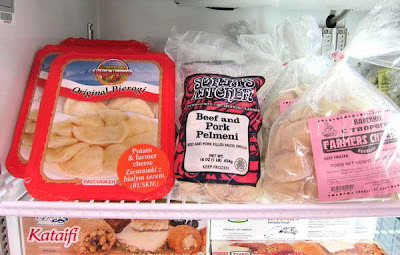 Try these, or the similar looking pelmeni, all free of preservatives. Have a sweet tooth? There’s rows of sweets, free of Aspartame and MSG!. Vegetable spreads, caviar, Bulgarian flour? All here. Soon there will be wines and beer, as the store expands its offerings and customer base. 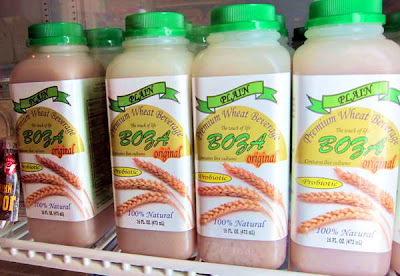 A rarity is Boza, a wheat drink that some customers buy by the case, when they find it! There’s a few dozen fruit drinks like sour cherry, that others were buying by the armful. With 900 items, stock up on halva, sauerkraut, Greek and other coffee beans-you start to understand the variety that’s here! 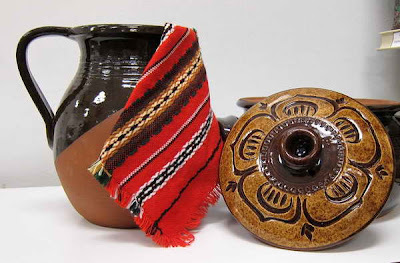 This type of attractive brown and tan clay casserole pots and pitchers have been used for centuries for cooking. Moe will give you recipes. Take your casserole pot from oven to table, so your family and guests know your food is cooked and served from your heart. Who is competition? No one, really. 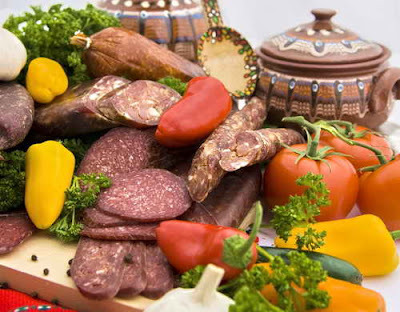 Camilla’s Eastern European Market on the North Trail has different foods, from Russia and Eastern Europe. These two markets, each with unique regional foods, nicely complement each other. Same for Airport's European Food Market's Polish items. Disclaimer: I do not receive any compensation for posting this. I want to see an independent market succeed. And, 5% off on great food is a deal! wow!!!!! what an extensive article and abundance of pictures!!! Looks nothing less of fantastic :) And I am a regular customer there so i can confirm that the store is VERY well deserved of all the attention. Thank you for your contribution and support!